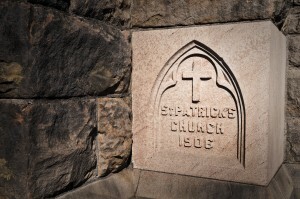 The Cornerstone e-newsletter is one of the many ways we communication at Saint Patrick Catholic Church. It is a parish communication launched in January 2016 and it is published weekly for the Saint Patrick Catholic Church community. It includes updates on parish events and ministry programs similar to the Blarney Stone published for the Saint Patrick Catholic School community. Why Should I Sign Up for the eNewsletter? The eNewsletter makes being up to date on happenings in an around Saint Patrick Catholic Church easy. Read The Cornerstone every week and stay in the know about important news from the parish— from Holy Day Mass schedules to opportunities to deepen your prayer life and more. Not only will the eNewsletter keep you informed of parish happenings— it will help save postage fees and helps us preserve the environment by saving paper resources. Pope Francis’ 2015 Encyclical on the environment— Laudato Si calls us to be good stewards of the enviroment and take care of our common home. Subscribe to The Cornerstone or The Blarney Stone with the click of a button. If you have any trouble receiving The Cornerstone after you’ve signed up for the e-newsletter or have questions about the newsletter or how to submit news for consideration, send us an email and tell us. The Cornerstone— the parish eNewsletter and The Blarney Stone— the School eNewsletter are archived together for your convenience. Do you have a story to share or an upcoming event for your Saint Patrick Catholic Church or School affiliated organization or ministry? Send us the scoop!